Through a relationship announced a few months ago, NDC International is now representing Boschman Technologies in the Eastern USA. Boschman, based in the Netherlands, has been a high-end niche player in the semiconductor packaging equipment industry since 1987. They specialize in the development of advanced Film-Assisted Molding (FAM) and silver sintering systems for electronic assembly industries across the globe. Boschman has been one of the key players involved in developing silver sintering technology. Together with Advanced Packaging Center (APC) and Alpha Assembly Solutions, Boschman has been on the leading edge of pioneering this new industrial bonding technology. Below we have summarized an article published in Bodo’s Power Systems written by Marco Koelink (APC) and Michiel de Monchy (Alpha Assembly Solutions) – read the full article here. Our customers are very interested in learning more about silver sintering – an innovative technology that offers superior thermal and electrical conductivity. Increased interest is fueled by the growth in electronic vehicles where energy efficiency is of paramount importance, and by an increased concern for the environmental impacts of lead-containing bonding materials. Despite the enthusiasm for Ag-sintering solutions, the main concerns around making a transition to this technology are cost and reliability. As the technology matures and more wide-spread applications are developed, cost will also fall into line with more traditional bonding materials. But what about reliability? Several materials and technologies have been introduced recently that have allowed silver sintering to become successfully industrialized. Alpha Assembly’s Argomax product group allows sintering at or below the temperatures needed for lead-free solder reflow. In combination with a relatively low pressure of maximum 10 MPa this allows for a very wide range of products to be sintered. Argomax can be delivered through either paste or pre-dried film which also increases possible sintering applications. Additionally, Boschman has developed both semi-automated and fully-automated pressurized sintering systems that allow independent control of temperature, time and pressure expanding reliability and range of application. Studies show that Ag-sintering is a proven and reliable emerging technology for thermally demanding semiconductor and electronic applications. 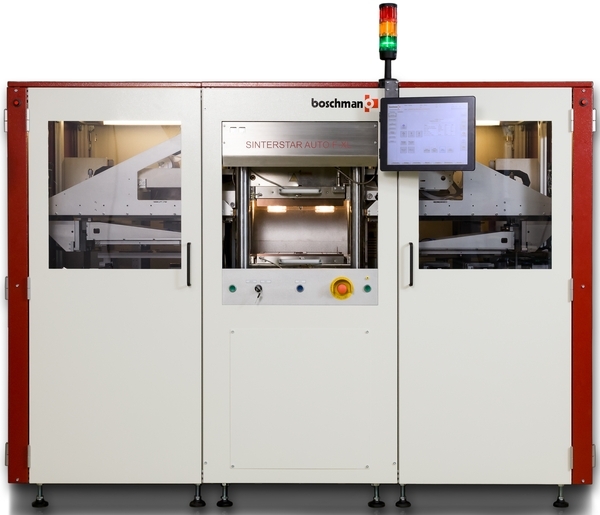 Boschman offers two advanced sintering systems – semi-automatic and fully-automatic. Semi-Automatic: Their semi-automatic system can sinter a wide range of different devices including LED, power, igbt, qfn, clip/heatsinks, thyristor and custom-designed power module devices. Boschman’s unique high-precision dynamic insert pressure-control technologies allow you to sinter multiple dies with different die thicknesses resulting in controlled and predictable bond strength. Fully Automatic: Boschman’s fully automatic Ag sintering systems offer the absolute highest throughput available on the market. Their systems can sinter a wide range of devices from LEDs, Power Devices Clip/heatsinks assemblies, solar (CVP) cells, to custom designed power modules and more. Boschman’s Ag systems offer the largest sinter area on the market, coupled with precise process control and monitoring. Contact us to discuss how Boschman’s Silver Sintering Systems can go to work for you.